Someone appears to be taking their Oscar snub a little hard. Despite a critically-acclaimed performance and a fan-generated campaign for Academy recognition, Uggie, the scene-stealing Jack Russell Terrier from The Artist, has announced his retirement. According to his trainer, Uggie will retire from filmmaking. According to Wikipedia, Uggie was rejected by his first two owners as being too wild. He was about to be sent to a dog pound, but was adopted by Von Muller, who only intended to foster the dog while he found it a new home; ultimately he decided that Uggie should stay. His first named role, and big break, was as “Queenie” in Water for Elephants, alongside Robert Pattinson, Reese Witherspoon, and Christoph Waltz. 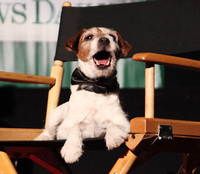 Uggie won the Palm Dog Award for best performance by a canine at the 2011 Cannes Film Festival, for his role in The Artist. The film is nominated for 10 Academy Awards. Uggie also has two Golden Collar Award nominations. Speaking of Oscar nominees, it was difficult to miss Jessica Chastain in 2011. The actress starred in more than six films last year, including The Tree of Life, The Debt, and Take Shelter. She is nominated for Best Supporting Actress for The Helpand is the apparent owner of a three-legged pooch. Check WebVet.com for the full story.